Now here’s a classic! In this lovably absurd sequel to Best of the Best (1989), illegal, underground Punchfighting matches are taking place in a secret club called The Coliseum. The front is a Las Vegas dance club called The Stock Exchange, but behind the scenes, “Gladiator Fights” are taking place (remember, at this time, the TV show American Gladiators was huge). Specifically, fighters dress up in absurd outfits and pummel each other to death. The star of the show is the arrogant, powerful and unbeatable soulless automaton Brakus (Moeller). When the likable Travis Brickley (Penn) dies at the hands of the nefarious Brakus, only fellow fighter Alex Grady, his young son, inexplicably named Walter (Gross), and of course Tommy Lee (Rhee) can get to the bottom of this illegal Punchfighting operation. To do this, they head out to the desert so James (Landham) can help them train. Oh, and one more thing...WAYNE NEWTON is the head of this evil hydra. Only in the early 90’s could a mix of utter silliness and brutal violence come together like this. Not only that, but we feel this movie was instrumental in promoting the Punchfighting genre. The Best of the Best series was surprisingly popular in video stores and on cable channels, and many people first got their taste of Punchfighting because of them. So for that, they deserve a lot of credit. Additionally, this was a time in which filmmakers felt that they should get quality actors and teach them to fight, instead of the other way around. 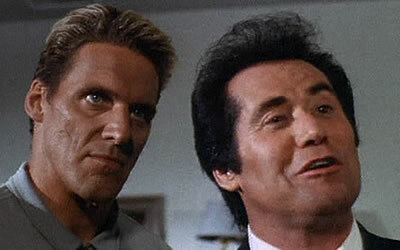 That they should get Eric Roberts and Chris Penn, instead of any old meathead. And at least here, the formula works great. And when we think “action movies” we immediately think “Wayne Newton”. Newton is a showbiz professional and gives his all here, and he, for whatever reason, really seems to care. he gives an energetic, big performance, and his presence sets the movie apart and makes it really enjoyable. And while it’s great to see Chris Penn, Wayne Newton, Walter the kid (who looks more like a 35 year-old stunted adult), who loves his Tetris, and Eric Roberts, complete with his tomato apron, AND Phillip Rhee, Sonny Lanham, Meg Foster and Nicholas Worth, lest we forget....BRAKUS? The writers of this movie must really be proud that they came up with the name Brakus, because it is said a minimum of 36 times throughout the movie. Ralf Moeller plays the classic German baddie, and a lot of Best of the Best 2 is lifted from Rocky IV (1985). The invincible Teutonic muscleman is the antagonist, and our heroes must go out into the wilderness to train to beat him (why are Phillip Rhee’s relatives Indians for some reason? ), and of course the parallels between Apollo Creed and Travis Brickley. There are many funny bits, Eric Roberts seems tipsy (if not drunk) throughout the movie, and all is well and good, but even as lovable as it is, it is a bit overlong. If the movie had been chopped down by about 10-15 minutes, we’d be dealing with an even bigger classic. But this is one David and Goliath tale that can certainly withstand multiple viewings. 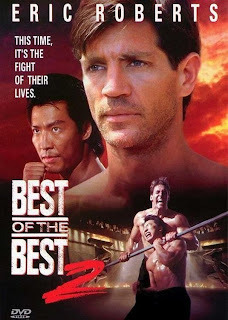 Featuring the memorable title song by Mark Free, Best of the Best 2 just narrowly makes it into the ranks of a must-see. I loved those films especially the first one with james Earl Jones as the coach. Yup, classic movie (much better than the first) and a great review. Ricky: The 1st definitely wasn't bad...this one ramps up the silliness factor big time! Lee: Thanks! Landham stood out as the teacher. Haha. This could be Eric Roberts at his coked-out best. He should have been in the sequels! I really need to get around to watching this, I have all four sitting there on the shelf haha. Also my RSS picked up your review for Subterfuge that you've taken down, but from what I've read, I'm ordering it! Really looking forward to your opinion on all 4 movies! About Subterfuge: Accidentally posted that this morning. Whoops haha...it will officially be posted on March 26th. Happy you are going to order it though, it is ridiculous fun! What happened to your review of Subterfuge? Accidentally posted it! Haha. It will be posted in March. Tomorrow will be posting Best Of The Best 3. Part 3 is my personal favorite, but this one was pretty good too. Shame Phillip Rhee hasn't done more films. Totally agree with you! Rhee should have made more action films. Maybe one day we will see Best Of The Best 5! If no one else is going to say it I will. This film is the Best of the Best of the Best series. Brutal fights, training montage, cheesy rock songs, Wayne Newton. How come your skipping part 1 Ty? Haha, it is the Best Of The Best! It is hard to beat this one. Wayne Newton should have come back in the sequels. We are skipping part 1 because we don't access to it at the moment...we will soon! I LOVE this film! So odd in so many areas, casting for one! But it's such a great example of 90's action cinema. Sonny Landham stole the show for me. I wish that guy had a bigger career than he did. I know he had a reputation, but he is one badass. Thanks! Totally agree, they ramped up the brutal action and silliness factors. The idea of Wayne Newton as an evil fight promoter is absolutely brilliant! Wasn't he also a villain in one of the Timothy Dalton James Bond films? I think he had a minor "villain" streak going there. lol. Lol! He should play more villains...same with Robert Goulet! Haha. It could be the Battle of the Las Vegas lounge singers! "Lovably absurd", can't think of a better description of this, tons of fun, very silly. Great stuff. Thanks! This one of the best action flicks of the 90s. Brakus and Wayne Newton were absolutely hilarious. Wayne Newton rules! Geeze...I actually didn't know there were even more sequels to this franchise after this one. I actually kind of dig the first one though I haven't seen it in a while. Haha, he sure does! He was at his "Best" in this. The sequels are not bad either.